“The Dry,” Jane Harper’s first book in her Federal Agent Aaron Falk series set in Australia, was stellar. Simply stellar. “Force of Nature” can’t compete with “The Dry.” In the first book, a death in Falk’s past, when he was a teenager, came back into play. That story wasn’t just about a death but also about Falk’s life in a very small town. “The Dry” had depth, well-rounded characters, and an exploration of the narrowness of small town life. It was deeply moving, especially by the depiction of a drought-devastated area. 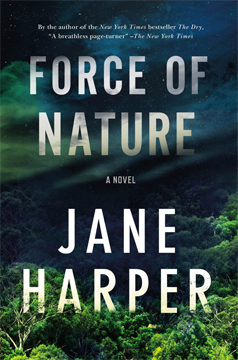 “Force of Nature” can’t compete with the range of that story, but Harper once again presents a well-written novel with evocative descriptions of a wild area of Australia and a fundamental understanding of human nature. “Force of Nature” succeeds, although the originality of “The Dry” has been left behind. Now Falk is simply a cop with a case. Falk works for the financial investigation branch of the national police. His new partner is Carmen Cooper, late of Sydney. They work well together and are trying to close a case against a large company, BaileyTennants, for money laundering. BaileyTennants employee Alice Russell has been co-opted by Falk and Cooper to obtain documents which would prove the company’s malfeasance. Before she can turn over the last of the crucial documents, she is chosen to participate in a company retreat for team building. Team building is grimly the wrong term. Somehow, during the sure-fire team building exercise — traverse a section of the mildly rugged Giralang Ranges on a multi-day hike without guides — Alice has disappeared. The other women on Alice’s hiking team are her boss, Jill Bailey; Bree McKenzie, Alice’s beleaguered assistant; Lauren Shaw, a co-worker Alice has known since they were youngsters; and Beth McKenzie, Bree’s sister and company drudge. Somewhere along the line their train of thought derailed and they got lost. The remaining members of the team finally pop up far from where they should have been, tired, thirsty and hungry. And missing Alice. The story of Falk and Cooper’s search for either Alice or any papers she left behind alternates chapters with the story of what happened to Alice’s hiking group. Jane Harper is so good at leaving the hiking group’s chapters at a cliffhanger. She is also good at slowly revealing the stories behind the tensions in the group. What haunts the McKenzie sisters’ past? What haunts Lauren and Alice’s past? What haunts Jill? And finally, does the ghostly presence of serial killer Martin Kovac haunt the group? When Lauren and Alice were teenagers, Martin Kovac — now deceased — kidnapped and killed young women he found in the very area the group is hiking. Kovac had a son, Sam. Has Sam, who dropped off the police radar a while back, taken up where his father left off? Harper is also good at making all the trembling possibilities of that scenario come alive. 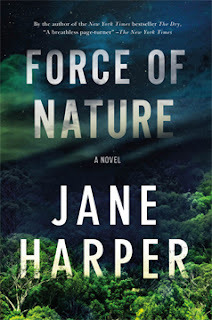 “Force of Nature” delivers a wonderful story, with flawed and human characters, especially that of Aaron Falk who is still trying to heal from the events of “The Dry.” On its own merits this book is strong and vibrant. The rains that spit, fall, and gust throughout the book play a malevolent background music. The tortured, dark, close woods the hikers must fight through mirror their personal voyages through tortured, flawed lives. The one cell phone that was smuggled on the hike is useless, a mockery of the group’s hope for rescue and a false conveyance for dealing with immediate problems in their real lives. Also, because of a faint link to the Giralangs, Falk is finally forced to deal with the relationship he had with his father, now deceased. It’s a small part of the story, but it’s the one part that makes the heart strings resonate.